VANCOUVER - The president of the B.C. 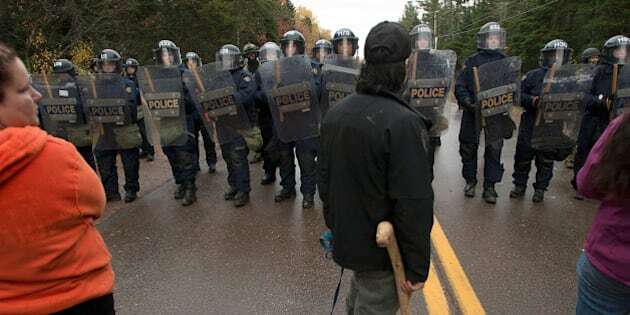 Union of Indian Chiefs says the federal government was sending a message to his province when police arrested shale-gas protesters in New Brunswick. Grand Chief Stewart Phillip told a protest in Vancouver on Friday that protesters in B.C. can expect the same kind of response from police. But he says British Columbians have a duty to take the issue of shale gas development into the streets. New Brunswick Mounties say they arrested 40 people on Thursday for firearms offences, threats, intimidation, mischief and violating an injunction outside a compound where shale gas exploration equipment was stored. They also say six police vehicles and an unmarked van were burned, improvised explosive devices were found, and officers fired non-lethal sock rounds and pepper spray at protesters.